Want a sushi party centerpiece that will really turn heads? Combining the magic of food-safe, scientific ingredients with the vivid, natural colors of mangoes and strawberries, Chef Devaux’s crouching Tiger Sushi Roll will undoubtedly become a major conversation piece. Beneath this orange exterior lies a succulent, yet subtly fiery salmon tartar sushi roll infused with Sriracha hot sauce, and deliciously seasoned, cooked white sushi rice – a mouthwatering harmony of flavors befitting of this magnificent beast! Using a mango splitter, or sharp knife, separate the stone and core from the mango. Then, using a dessert spoon, scrape out the pulp from both halves of the mango into a glass bowl. Discard the skin. Add the mango to the juicer and process, allowing the juice to collect in a large plastic measuring jug. Wash and prepare 4-5 large strawberries by cutting off the ‘heads’. Add these to the juicer also, and process into the same measuring jug. With a spoon, combine the fruit juice by stirring briefly until the liquid turns orange. Once combined, add 240 grams/ ml of the mango and strawberry juice to the jug. Blend for a few seconds once again on full power. Pour 100 ml of the liquid into a separate plastic jug, and set the first aside for now. Add 4 grams of squid ink to the new jug and blend well. Then, pour the contents of the jug into a deep saucepan. Bring to the boil, using a spatula to move the liquid. This will prevent it from sticking. Reduce the temperature of the hob, and simmer for 3 minutes. Lay the silicone mat, or cling film sheet atop the plastic tray. With a spoon, begin streaking short lines of the squid ink across the mat, covering the entire surface area. Refrigerate for a minimum of 30 minutes to allow the gel to set. While you wait, repeat the boiling/ simmering process for the mango and strawberry juice mixture, and allow to cool. Once the squid ink stripes have set, remove the tray from the refrigerator. Do not lift up the mat at this stage. Pour the entire contents of the pan onto the mat, allowing the mixture to spread as much as possible. If necessary, lift up the tray and tilt to ensure the liquid covers the entirety of the mat in a thin, even layer. Refrigerate for a further 60 minutes. Using a sharp knife, cut off the end of the butternut squash. Slice in half, and discard the seed end. With the skin intact, place the butternut squash into a large saucepan of boiling water. Cook, with the lid on, for approximately 5 minutes, or until the flesh is tender. Remove the squash from the pan. Once cooled, begin removing the skin of the skin of the squash using your knife, or a vegetable peeler. Cut the squash in half lengthways, and discard one half. Position the remaining piece of butternut squash with the flat side facing down on your chopping board. Slice off a section approximately 2.5 cm (1 inch) in thickness, and discard. Turn the squash over onto one end with the curved edge facing you. On the right hand side, make a 45-degree ‘slit’ with your paring knife approximately 1.5-2 cm in from the edge. This is easiest done by first making a straight, downward incision, followed by one at a 45-degree angle. Repeat for the left hand side, and gently ease out the strip of squash with the tip of your knife. With the blade flat, remove a strip of squash from between the ears to create the illusion of depth. Repeat for the outer edge of each ear. Return your knife to the right hand, outer edge of the head shape. Applying pressure, begin carving a rounded section, which will form the face. Stop approximately 1 cm from the bottom. Align your knife with this point on the outer edge and make a horizontal cut to form the profile of the paw. Repeat on the left hand side. To refine the head of the tiger, position it first so that the ‘face’ is in front of you. Roughly 1.5 cm from the front of the head, make a 45-degree cut, bringing the knife toward you, and down. The knife should stop roughly where the outline of the paws begins. Define the ears further by shaving off a little extra flesh – again with the knife at a 45-degree angle. Next, you’ll want to create more definition around the paws. To do so, simply cut out a 45-degree triangle on either side of the jaw (between the jaw and the paw). This will also make the jaw-line taper more naturally. Cut a vertical section across the bottom of the jaw to ‘separate’ it from the chopping board. To carve the mouth, simply align the tip of your blade with the top of the left paw, and trace horizontally across the tiger’s face. Then, bring the knife down and across to the other side, carving an upside down arc. Gently pull away the flesh from within the shape using the tip of your knife. Holding the tiger form in one hand, poke the tip of the knife into the roof of the mouth on either side to create tooth slots. Finally, create two equal sized indentations for the eyes. The depth of each should be enough to contain a grain of rice. Finally, carve two similar paw profiles from the leftover piece of squash to form the back legs. Pour a little squid ink into a glass bowl, and with a thin paintbrush, begin filling in the indentations of the eyes, mouth and claws. Paint on a small rectangle for the nose, and two triangles within the ear profiles. To create stripes, lightly streak the brush across the surface of the squash, applying the ink liberally. 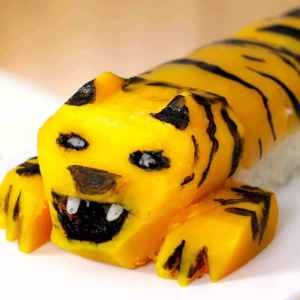 Pick up a cooked rice grain with the tweezers, and, holding the tiger face up, push the grain into the mouth slot created earlier. Repeat for the right hand side. Add a further half grain to each of the eye indentations, pressing them gently into the flesh to hold them in place. Set the finished piece to one side of your chopping board. Remove the mango gel sheet from the fridge and return to the tray. With a clean, sharp knife, carve a rectangular piece from the sheet, roughly the size of a half sheet of Nori. Lift up the section with the tip of your knife, then grab both corners with your fingers. Slowly peel the ‘skin’ away from the mat. Set aside on a flat plate while you create the sushi roll. Position a half sheet of Nori on your chopping board. With moistened fingers, transfer 120 grams of cooked white sushi rice over to the sheet. Fluff out the rice using your fingers, covering the entire surface area of the Nori sheet. Flip the Nori sheet over onto a bamboo rolling mat so that the rice side is now face-down. Squeeze two generous strips of Sriracha sauce across the central length of the Nori sheet. Then, spoon on the salmon tartar, covering the Sriracha sauce strips. Position your fingers along the tartar strip, and with your thumbs, bring up the bamboo rolling mat. Curling the mat over, begin rolling the sushi roll, applying continuous pressure to keep the contents in place. Once rolled, apply further pressure to seal the roll. Cover the sushi roll with a sheet of cling film. Use the bamboo rolling mat once again to ‘firm up’ the contents. Then, with a moistened knife, sever the messy ends of the roll. Cut the remaining piece into eight equal sections. Firm up once more using the rolling mat before temporarily removing the cling film. Lay the orange gel sheet across the sushi roll, positioning it as straight as possible. Cover the roll with cling film once again, and compress the ‘skin’ onto the roll using the bamboo rolling mat. Remove and discard the cling film. 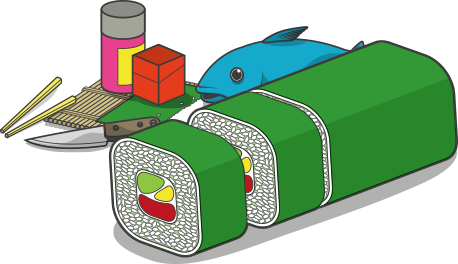 Transfer the sushi roll segments onto a rectangular sushi plate, aligning them next to one another to form the body. Position the head in front of the sushi roll, and the legs at either side of the rear. Serve with a small ramekin of Soy Sauce to compliment.